Iron is a vital element for plant life. Iron has a number of important functions in the overall metabolism of the plant and is essential for the synthesis of chlorophyll. In general, iron is poorly absorbed by the plant. It can only be sufficiently taken up by the roots in certain forms and under proper conditions. Potting mixes seldom contain too little iron, but it is possible that forms of iron that can be absorbed by the plant are lacking. The absorbency of iron is strongly dependent on the pH. Usually, there is sufficient iron present in absorbable form in acidic potting mixes. Iron has a number of important functions in the plant’s overall metabolism and is essential for the synthesis of chlorophyll. Strong yellowing of especially the young leaves and growth shoots between the veins. The best thing is to spray the plants with a watery solution of EDDHA or EDTA chelates. Iron deficiency can occur during periods of heavy growth or high plant stress and is characterized by a strong yellowing of the young leaves and the growth shoots between the veins. This occurs chiefly because iron is not mobile in the plant. The young leaves can’t draw any iron from the older leaves. 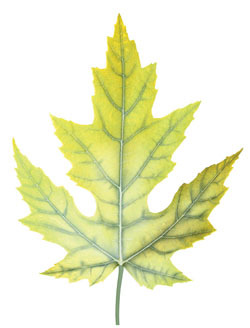 With a serious iron shortage, the older leaves and the smaller veins in the leaf can also turn yellow. The root environment contains a lot of zinc and/or manganese. Iron chelates can be added to the substrate. Drainage can be improved, or the ground temperature can be increased. A leaf nutrient with iron chelates can possibly be applied. If a good fertilizer is used with hydroponic growing, an iron deficiency is almost out of the question. The best thing you can do is to spray the plants with a watery solution of EDDHA (max. 0.4 grams per gallon) or EDTA chelates (max. 2 grams per gallon).